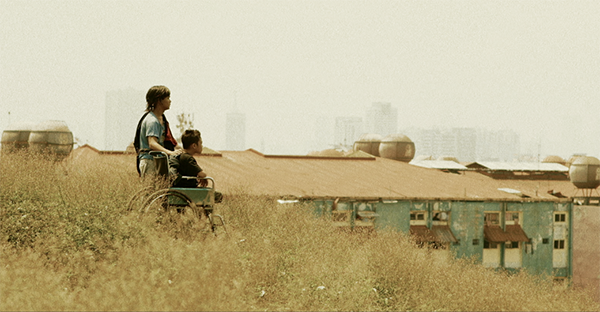 Having won several international awards, and most recently a Grand Prize (Best Film) and Excellent Young Director Award at the Gwangju International Film Festival in South Korea, Derick Cabrido’s CHILDREN’S SHOW will be having a special homecoming screening at the Teatrino Promenade in Greenhills, San Juan on June 6, 2015 630PM. Children’s Show was based on Cabrido’s own documentary about children exploited as prizefighters in an underground combat betting game. The film premiered at the 2014 Cinemalaya Film Festival winning Best Cinematography (Mycko David), Best Editing (Gerone Centeno), Best Sound (Jonathan Hee/Bryan Dumaguina), and Best Supporting Actor (Allen Dizon). Propelled by the powerful lead performances of young actors Buboy Villar and Miggs Cuaderno, Children’s Show follows the underground fighting lives of two brothers in the bellies of extreme urban poverty. Their lots will become much worse when their wayward father returns. Cabrido’s camera is seething and immediate; his visual flairs rapturously stir the scenarios written by Ralston Jover to an intense conclusion, while carefully laying out the narrative to a familiar yet bewildering territory. Children’s Show is unquestionably one of the best Filipino films last year, having reaped a total of 11 awards and 6 nominations so far. However, it is baffling to know that it never made a better impression at this year’s Gawad Urian, having only received one nomination (Best Cinematography), while Dagitab (Dir. Gian Abrahan) rakes homecourt familiarity by sweeping an 11-nomination advantage. Dagitab is about a middle-aged couple who are UP professors/writers. Aside from winning three major awards at a US-based international film festival, Children’s Show is also the lone Philippine entry at the annual Fribourg International Film Festival in Switzerland. Cabrido’s first directorial short about underground human organ selling was featured at Cannes Film Festival Short Film Corner in 2013. As the executive producer of GMA 7’s Frontrow, he is also a recipient of various international acclaims for his documentary films. DLIST.PH highly recommends Derick Cabrido’s Children’s Show. Go see it, and tell us what you think! Tickets are available at the Greenhills Promenade or Theater Mall beginning June 3 for P200. You may also call 721-2949 (10AM to 5PM) for reservations.